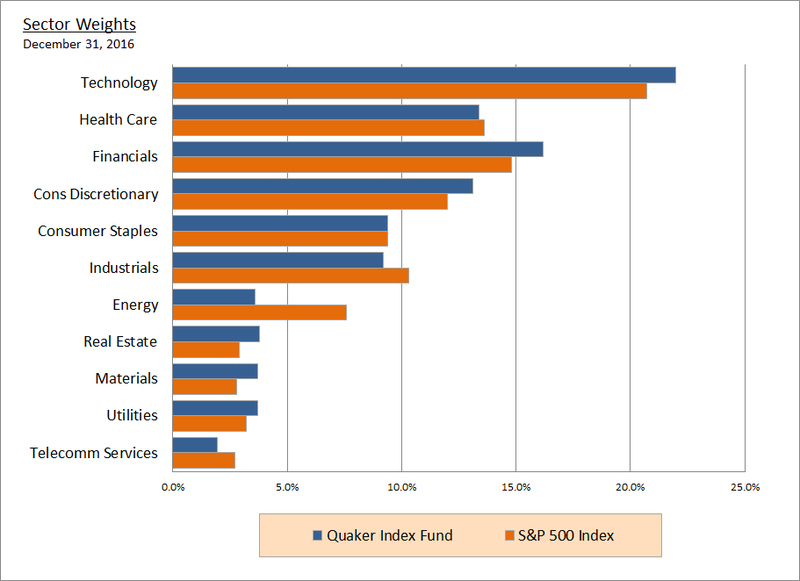 The Quaker Index Fund (QIF) is an all equity fund based on the S&P 500 exclusive of those excluded by FFC’s Quaker values screens. It has approximately 370 holdings, is diversified across economic sectors and is designed to track the S&P 500 Index with low annual turnover and low tracking error. The Quaker Index Fund is intended for larger investor organizations, including Friends schools, churches and meetings, retirement communities, foundations, colleges and universities with a five year or longer investment horizon. Minimums apply. Income is automatically reinvested – there is no semi-annual income distribution for QIF. Additions or withdrawals, as with all FFC Funds, can be made at any time and at no cost. Investors may hold units in any of the Friends Fiduciary Funds in a single account. For more information or to invest in the Quaker Index Fund, please contact Friends Fiduciary at 215-241-7272 or info@friendsfiduciary.org. 3Quaker Index Fund Benchmark: 100% S&P 500 Index. Fees: The Quaker Index Fund operates with a tiered fee schedule of 0.30% (30 basis points) on the first $5 million, 0.25% (25 bps) on the next $5 million, and 0.20% (20 bps) on balances above $10 million. The Quaker Index Fund invests in large cap domestic equities through an SEC registered, third-party advisory firm. The market price of the equity investments may fluctuate and may decline along with moves in the broader equity markets or due to economic, industry or company specific events. Portfolio construction, sector allocation and portfolio management practices may not deliver desired results. The investment manager who works in an advisory capacity may not deliver investment results as anticipated. Investors in the fund could experience a decrease in the principal value of their investment or go through a period of underperformance relative to the benchmark.